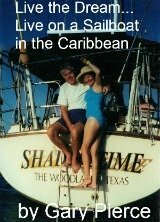 When we first moved on to our boat we marveled at how every section of the boats interior had a purpose with no wasted space. This reinforces our opinion that people can live in smaller spaces due to the maximum utilization of that space. 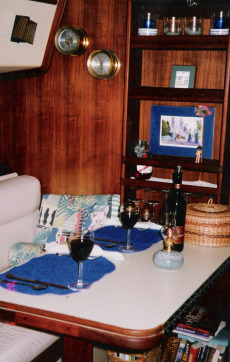 Here is the table lowered for an on board dinner for two... when not in use the table folds, and is secured, against the bulkhead where you see the pictures and small shelves. A lot of boats have their mast running through the cabin where the table is extended. By placing the mast in the bulkhead wall this gives you a lot of space when the table is not in the down position. In fact when the table is up this space that you can fully stand up in below is nearly doubled. Note that there are two leaves on the table with the hinges all along the side. This can be spread out and you can have a dinner for six... think Thanksgiving... very comfortably below. This table is a example of how sailboat interiors make for a good lesson in efficient ergonomics. Here is the same space on our boat but with the table in the upright and locked position... can you see the clevis pin that is directly below the hatch? The table was in this position 99% of the time which gave us the freedom of being able to utilize most of the space below. Think about this feature for your home or RV... it simply uses the concept of a Murphy bed. Before you or your guests go to bed you pull the Murphy bed down from the wall and put it back in the morning. Perhaps this can give you an idea of better utilizing space... it is very functional and efficient at the same time. Stop and think, if you sit down at a table to have your breakfast, how much more room would you have if the breakfast table was retractable. 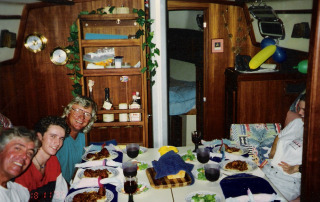 Sailboat interiors... dinner for six? Here is the same space seating six... with the table leaf extended. I think this was Thanksgiving... but then again it could have been an ordinary Tuesday night. 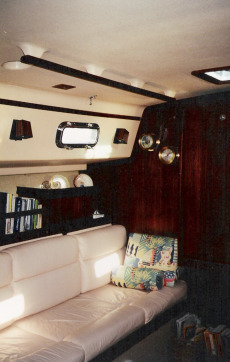 See the mast that is located in the bulkhead separating the living area, from the bathroom and V-berth... the Capt. 's quarters. Does this look like anyone is deprived? Opportunities for frugal retirement living, or just plain frugal living, are everywhere if you look hard enough. Just a few feet from the table is where the galley is located. 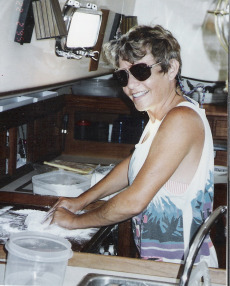 Here Julie is preparing the dough to make bread from scratch... that's right we could make bread on board. The stove and oven are directly below the board she is using. To her right, I really should say starboard, is where the refrigerator freezer was located. Due to very thick and efficient insulation our 12 V refrigerator freezer held a tremendous amount of food. Especially important on a sailboat is cold beer... and friends our beer was cold on the boat. The sunglasses... I have no idea.